We completed the third of three very long build sessions today. The main progress of today was a couple new iterations on our shooter prototypes. The morning started by trying to add a bottom roller to our horizontal wheeled shooter to try to add spin while maintaining our power. This wasn't that successful. We weren't seeing the spin we wanted and the whole unit would be difficult to package. The next concept was a double wheeled vertical shooter with a set of bottom wheel that give more time for the ball to accelerate and a top wheel that has it's velocity controlled to adjust the spin on the ball. The prototype was made out of 1/4" hardboard that we cut on our CNC router. This setup seems slightly easier package inside the frame of our robot while still staying under the low bar. Using two 775pros geared 3:1 we were able to make around a 15 shot from 1 ft off the ground. This setup currently doesn't give us the spin we are looking for. 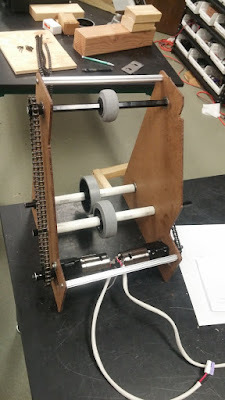 Tomorrow we will likely be slowing down the top roller and making the button two rollers run off separate motors to make sure we aren't slowing down the final wheel to much before the ball ever reaches it. 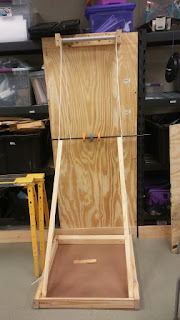 We'll also start running the prototype off of a roboRIO and Talon SRX motor controllers so we can monitor the speed of the wheels and eventually add PID closed loop control to start working on consistency. We will still need to play around with wheel configurations, compression, wheel width, wheel speeds, and more. We spent a few minutes looking at some concepts for scaling the tower. 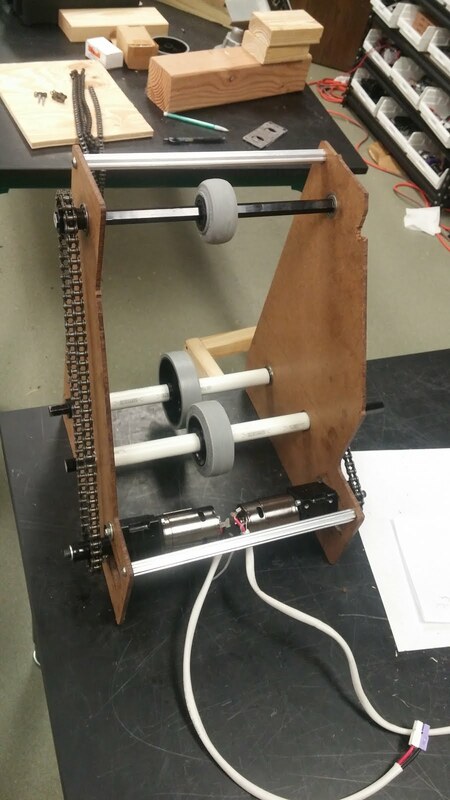 We added wheels to a previous prototype to reduce the friction between the arms and the wall. The next step will be to power these wheels and see how much assistance they will be able to give our winch during the climb. The current concept is that this arm would be able to fold down to allow us to go under the low bar. We began work on a programmable LED signal system that will be able to give our drivers status updates about the robot without taking their eyes away from the robot. A large part of any season is buying the needed parts to make the robot. So far we have purchased enough AndyMark pneumatic tire hubs for our practice and competition robot. We are purchasing pneumatic tires from MBS a company that specializes in mountain board tires. The inner tubes can be sourced from a variety of sources and even some amazon distributors have them. We put in our first large VEXpro order for the gears we need for our sheet metal ball shifter inspired by 1114's 2014 robot and sprockets for our drive train. We are going to continue refining the shooter and working towards a consistent shot. Once we have the details of the shooter closer to their final design we will be able to integrate a collector and loader system that reliably feeds the ball to the shooter. Our breaching arm will be prototyped this week to make sure it can raise the portcullis and lower the CDF. We will be building a prototype sheet metal drive train to make sure that our configuration can successfully get over the defenses under its own power.